Use the instructions posted below to learn how to find and apply for jobs in your area using the online BJ’s job application. There is currently no offline (i.e. printable) application available, in-store/corporate jobs can only be applied for online. About the Company: BJ’s is a wholesale retailer that is a members-only store. The company over 200 locations spanning across the Eastern United States. Step 1 – Click here to be taken to the main jobs website. Step 2 – Search for openings by keyword, or by selecting a location from the list of options. Note: If you want to search for corporate positions click one of the “Corporate Jobs” links. Step 3 – Scroll down to view the results. Step 4 – Click the link of the position you want to apply for. Step 5 – Read the job’s description and requirements, and then press the “Apply Now” button to go to the next page. Step 6 – Enter your email address and then click the “Continue” button. Step 7 – Review the detailed job overview, and then click the “Apply to this Job” button near the bottom of the page. Step 8 – Log in to your account, or create a new one by pressing the “Create New Account” button. Step 10 – Agree to the terms and then click the “Continue” button to move on to the next step. 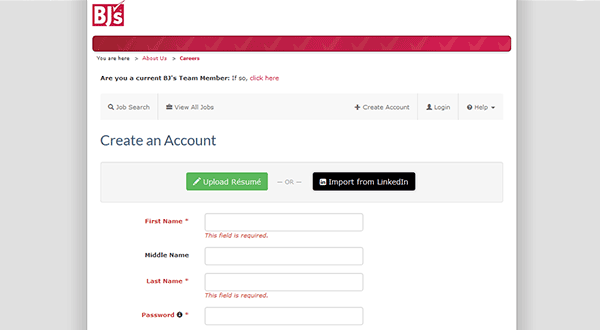 Step 11 – Resume Profile Creation – Upload your resume, or copy/paste it into the input form. Click the “Next” button to go to the next step.